Earnest Hemingway once said, “as you get older, it is harder to have heroes, but it is sort of necessary.” I agree with the first bit and am fortunately not so sure about the second. Three years ago, at the Hop Farm in Kent, one of my sometime heroes, Bob Dylan, rather spectacularly dropped off the plinth on which I had placed him. I had been really excited with the prospect of seeing him live and suddenly there he was croaking away on the stage; or I assumed it was him; the songs that I had loved when I was a student first time round were unrecognisable. He himself was unrecognisable because he did not allow any camera to show a close-up, so all one could see on the big screens was that there was someone there, somebody playing a guitar and making a noise. In the interests of objectivity I will report that the reviews of Dylan at the Hop Farm were mixed; some people apparently liked it. As you can tell, I did not and I was not alone; unreported in the reviews was the fact that quite a few people left early. You can see why; he didn’t talk to the audience at all; he gave every impression of being miserable so that one wondered why he was doing it. Challenge the audience, yes but give them something of what they want. Compared with Ray Davies of the same vintage and at the same venue who sang songs we all recognised and seemed to be having a wonderful time, Dylan’s performance seemed mean-spirited. It wasn’t his age; I saw Leonard Cohen when he was 75 and he managed to enchant an audience with his exuberance and charm despite the driving rain. 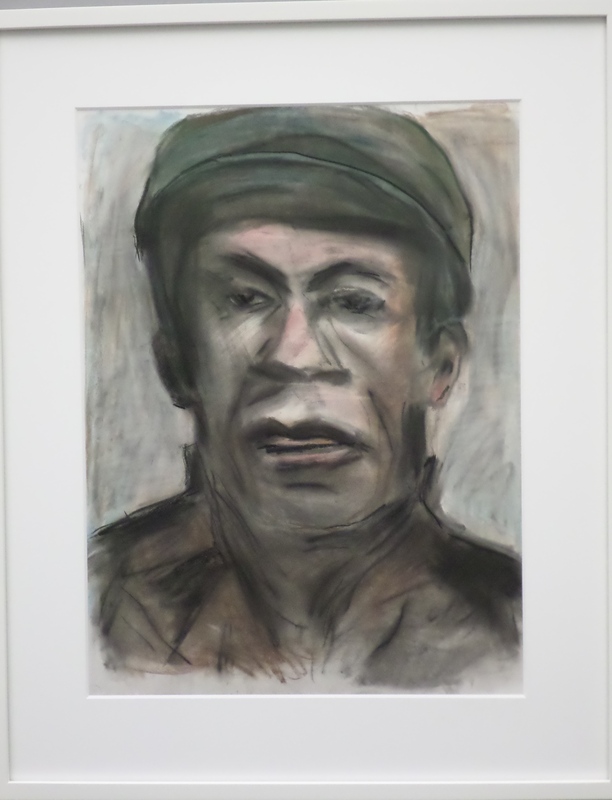 I tell this story to explain why I somewhat half heartedly went to look at Face Value, a collection of his drawings now showing in the National Portrait Gallery. I wouldn’t have made a special journey to do so, but, as the Gallery is near Charing Cross where I get my train to Hastings, I thought I would take a look. It is fair to say they were not bad. I mean that in the literal sense rather than that they were quite good. There are twelve portraits in all; each has a made up name such as Red Flanagan or Skip Sharpe and the first thing that strikes you is how remarkably similar they are. They are all the same size; they have the same sort of swirly smudged backgrounds, are broadly the same colour – tones of grey with the addition of some earth colours. There are three women among the twelve but oddly their faces do not stand out from the others. All the works are drawn full face. 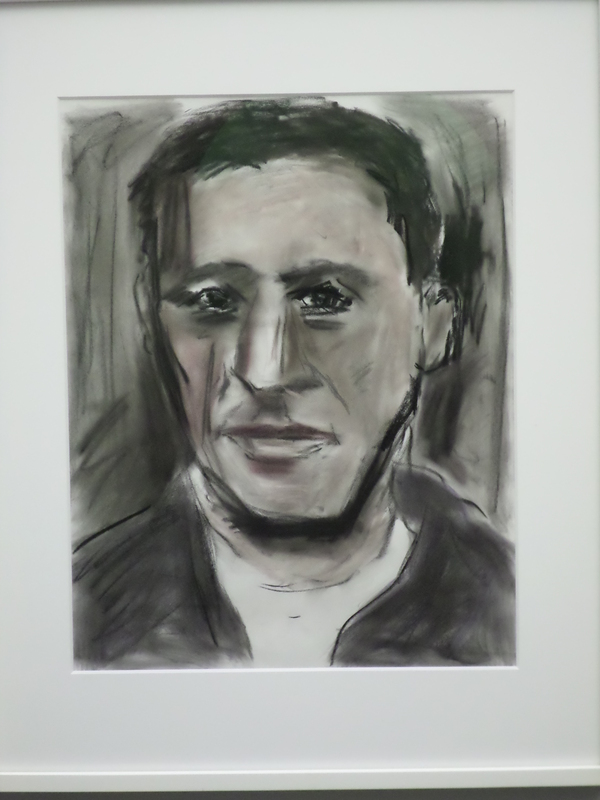 As, unlike most pictures in the National Portrait Gallery, they are not of specific people but of more generic types it is not surprising that the features particularly the eyes have the same intensity. Of course because they are imaginary, they reflect more about Dylan than they might if they were trying to portray the essence of some particular individual. They are quite crudely drawn; members of most A level groups could do as well. Despite that, there is certainly an energy to them. The effect of the twelve faces around the wall was a striking demonstration of the power of repetition. If I hadn’t been to the Hop Farm concert I might have said stick with the evening job; actually I think – stick with the art. Leave the music alone and let us remember it as it used to be.